Please visit the Mind Body Spirit exhibition page and contact the artists directly for purchase inquiries or to see more of their work. Based in Wilmington, DE, Jarred Fisher is a contemporary realist artist. He studied at Nelson Shank’s Studio Incamminati in Philadelphia, PA, graduating in 2016. He also holds a degree in Fine Art from Delaware College of Art and Design in Wilmington, DE. His work has been part of numerous juried exhibitions including shows at Freeman’s Auction House in Philadelphia, PA, Manitou galleries in Santa Fe, NM, and Stanek Gallery in Philadelphia, PA. His work has also received various recognitions and awards. As a firm believer in the importance of skills-based art education, Fisher also serves as an Upper School Art teacher at Doane Academy in Burlington, New Jersey as part of Studio Incamminati’s outreach program. Denisa Prochazka is an award winning Canadian artist residing in Ottawa, Canada. 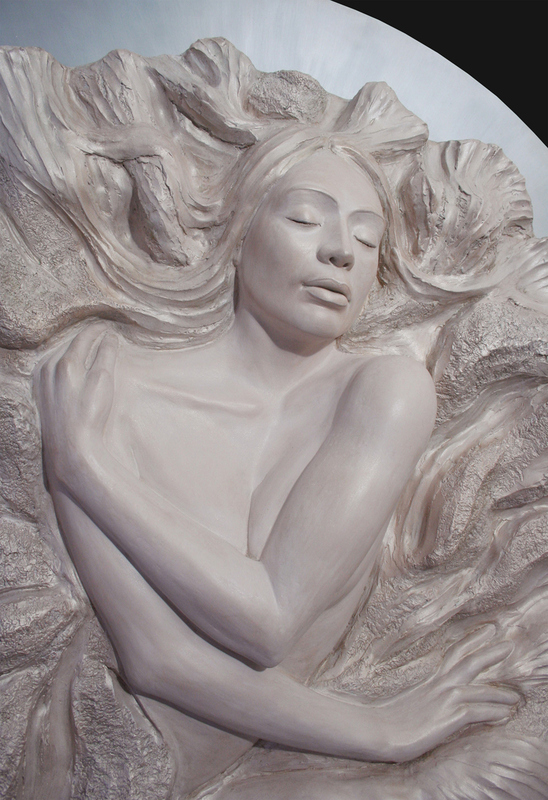 She is a traditionally trained figurative sculptor with a passion for portrait sculpture and large figurative reliefs. Denisa grew up in her mother's ceramic studio in the Czech Republic being introduced to clay at a very young age. She graduated from O.C.A.D University in Toronto and continued her studies in Florence, Italy. 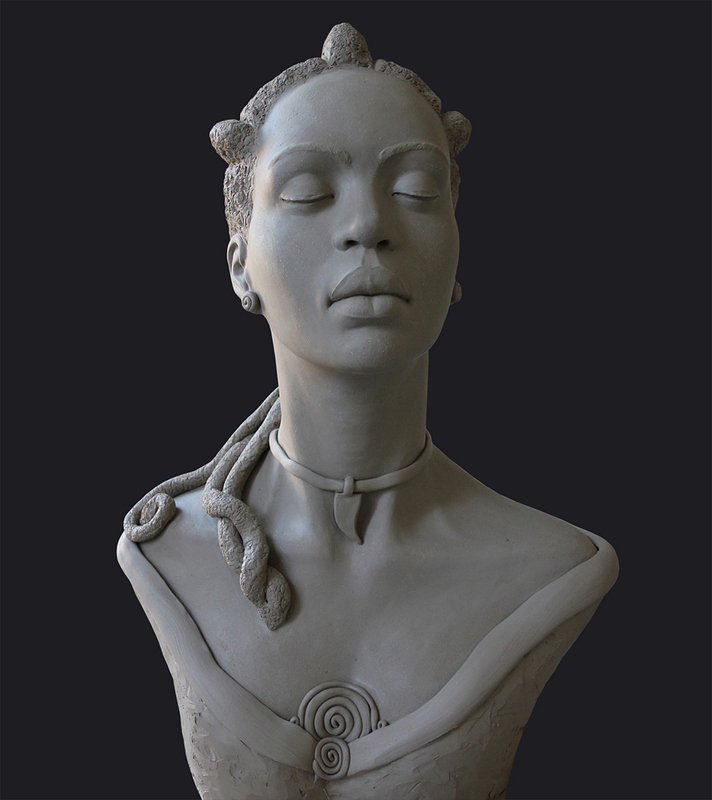 Her sculpture has been commissioned as Awards of Excellence by the Nelson Mandela Legacy and Ottawa University, BHM. Denisa is currently an Associate Member of the National Sculpture Society in New York, the Allied Artists of America, New York, and The Healing Power of Art & Artists, Manhattan Arts International, NYC. "I became increasingly aware of my feminine perspective and reflection of the life around me. The need for creation became reinforced with the birth of my own child and the desire to heal, protect and empower. I felt the need to portray feelings, needs and a visual conversation within the sublime. Symbolism transcends the physical into the spiritual realm. My goal is to bring my art forward to public spaces so that passersby can find peace, beauty and healing connection for a moment in time in their life’s journey." View more of Denisa's work on her website. Follow her on social media here: Facebook, LinkedIn and Instagram. I briefly attended the Cleveland Institute of Art (1992-1993) but found hanging out at the Euclid Tavern and the Cleveland Museum of Art much more educational. Music And Art have been a constant force in moving my life forward. Although the past is a constant reminder of promises forgotten. I now make good on the little lies that get me through the night. 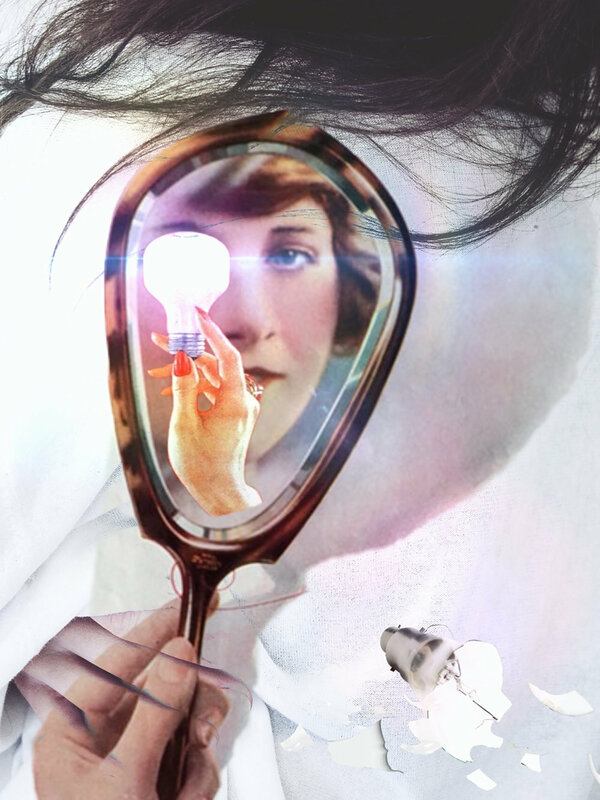 The reinventing of the dream-self on every new morning. The doorway between the conscious self and the subconscious ideal has been left open. What remains of the journey lies in paint. My Style is subjective to the viewers preconceptions. I am a figure artist. The rest is up for interpretation. The artistic influences on my paintings are quite varied. I am most influenced by the Symbolist. Which turned into the modern Illustration movement. Everyone from Klimt to Schiele from Bacon and Auerbach to Frazetta and Giger. All my idols are dead. It is my time to start a new generation of dreamers. All my work is for sale. I am sick of being a slave to my alarm clock. View more of Jeff's work on his website. I work in oils & usually do my sketching on the canvas in oil as well. I am interested in achieving actual color as opposed to perceived color & have been working on a series of life paintings. I am interested in the human form & putting figures into colorful designs, that move the viewers eye around the canvas & create a feeling of depth. Within this framework, using ordinary people helps to create a sense of uniqueness. I prefer the viewer to stand very close to the painting; to feel surrounded by it. Born in the UK Michael spent fifteen years living in Israel. It was only in 2000 when he joined the Tel Aviv Camera Club that he took photography more seriously, culminating in four solo exhibitions and TACC group exhibitions. During 2003 to 2004, Michael helped set up of Ventures Group of Song-writers, Poets, Artists and Photographers which was a group that mixed artistic outputs for various products and became the group Publicity Secretary. In January 2005, he returned to London and joined the Isle of Wight Photographic Society and the Hampstead Photographic Society and went on to serve the HPS as Programme & Publicity Secretary. During this time, he initiated the HPS Newsletter which he continues to edit. Michael has had numerous solo exhibitions and had acceptances in various group exhibitions including the Royal Academy Summer Exhibition in 2016 as well as in various international salons of photography. His work can be described as either documentary or artistic deciding which style to use depending upon the end-use of the image. William T Erickson IV is a new artist known to friends for his inexplicable and unusual style and subject. His works share the unsettling flares of Salvador Dali and Andy Warhol while being more primal and simplistic. Bill’s art medium is charcoals and colored pastels on large 26” x 32” paper. Although Bill has drawn casually off and on most of his life, he didn’t start concentrating on this craft until 2017 when he bought his first easel and started to document his works. In 2018, he was selected a finalist to the BWAC Brooklyn Waterfront Artist Coalitions International Exhibition of Album Cover Artwork, and The Fusion Arts (Artsy.Net Gallery affiliate) 2nd Annual Black and White Art Exhibition. Born in New Jersey, Bill now resides in Jacksonville, Florida where he is a full-time Construction Management Executive. Visit his website. Send Jarred an email for more information about his work. View more of Candace's work on her website..
My current works focus on my reflections on how perspective significantly influence the human mind. I paint imageries of cartoonish figures and environments which symbolizes psychological ideas. I interpret the childlike quality of my works are stems from children’s book which is the first source of learning multiple ways of looking at the world to me. My paintings are documentation of my inner world which I believe having some connections with other people’s psychology. I hide symbolisms in my works to represent my ideas indirectly but into the viewer’s subconscious. Contrast to the childlike mood; the symbols are about sexuality, suppression, and complexity of the world borrowing from metaphors and theories of the outside world. This symbols are not limited to representative objects but extend to visual elements such as lines, shapes, and textures to an appearance of the artworks. I want to share my ideas and sensations which could remain private, wish to connect with the viewers through my works. Bio - Young Ju Lee was born and raised in South Korea. She immigrated to Canada and graduated from Langley Fine Arts School in Vancouver. She is currently getting her BFA in painting from Maryland Institute College of Arts in the United States. Visit her website and follow her on Instagram. Email Gaylord for more information about his work. I became increasingly aware of my feminine perspective and reflection of the life around me. The need for creation became reinforced with the birth of my own child and the desire to heal, protect and empower. I felt the need to portray feelings, needs and a visual conversation within the sublime. Symbolism transcends the physical into the spiritual realm. My goal is to bring my art forward to public spaces so that passersby can find peace, beauty and healing connection for a moment in time in their life’s journey. Nick Truhan was born in Westlake Village, CA in 1990. Having grown up on the cusps of Los Angeles and Ventura county, he was exposed to the beautifully inspiring intimacy of nature and the sea. He found a love for capturing the scenery around him with video editing, photography, and his own unique coloring and editing styles in order to represent a certain place and moment in a wholesome, nostalgic blend in hopes to inspire others to appreciate the natural beauty around them. He attended Loyola Marymount University from 2009 - 2012 where he studied graphic design and fine art after receiving a baseball scholarship. It was in 2012 when he was diagnosed with Lyme Disease after being bitten by a tick, which led him to dropping out of school and undergo treatment for the next 3 years. During this time, he was challenged finding his familiar inspiration from mother nature, contemplating how something so familiar, something that was a continuous source of love and creativity can vanish with a quick change of perspective and how that feeds into so many unwanted and unwarranted emotions. He soon channeled his reality through a different medium, music. Playing guitar and piano his whole life, he soon began writing and producing his own music, starting his own band and other various music projects based around his experience with having a chronic illness. After his treatment ended in 2015, he was recruited to play in various bands, giving him the opportunity to tour all across the United States. Here he was introduced to a vast palette of new places and people from all walks of life, which quickly inspired his artwork today. His "digital assemblages" are a mix of his warm nostalgic style on top of the reality of everyday life and the optimism he wishes we can all share. Nick currently lives in Los Angeles where he is a freelance designer, music producer, and musician. View Nick's website and follow him on Instagram.